When it comes to street style, Victoria Beckham almost always brings it. Earlier today(May 12th) the designer was spotted leaving a building in New York. VB is one of the few celebs that always wears their brand. 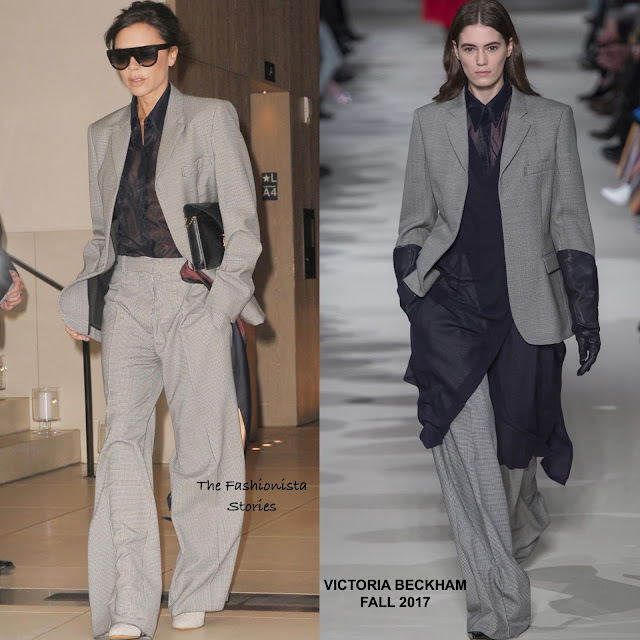 She wore a VICTORIA BECKHAM FALL 2017 grey two-piece suit with a sheer navy shirt underneath and a clutch with a stripe silk scarf attached to it. On the runway, the suit was layered with a sheer crossover long top which VB ditched and did not need. She looked cool & chill in her power suit. Are you feeling VB's street style look?